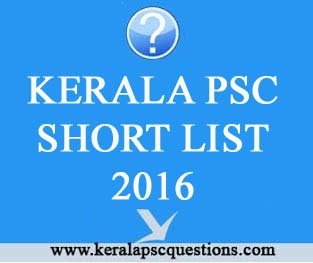 The following is the Short List containing the Register Numbers of candidates who are found provisionally eligible to be called for interview, for selection to the post of DEPUTY GENERAL MANAGER(GENERAL CATEGORY)- Statewide (Category No. 101/2010) in KERALA STATE CO-OPERATIVE BANK LTD. on `15925-36575/- on the basis of the Online Examination held on 16/11/2015. Note:-(2)The list has been prepared by including all the candidates who have attended the online examination.. Note:- (4)Candidates belonging to Other Backward Classes included in this list who are required to produce NonCreamy Layer Certificate as per G.O (P) No: 81/09/SC/ST/DD dated 26.09.2009 shall produce the same along with the other documents mentioned above at the time of verification of original documents. SC/ST candidates shall produce 2 copies of caste certificate obtained from Revenue Authorities not below the rank of Tahsildar as specified in Kerala Gazette.